This charming heritage hotel was built in 1892 as a nobleman's town house. 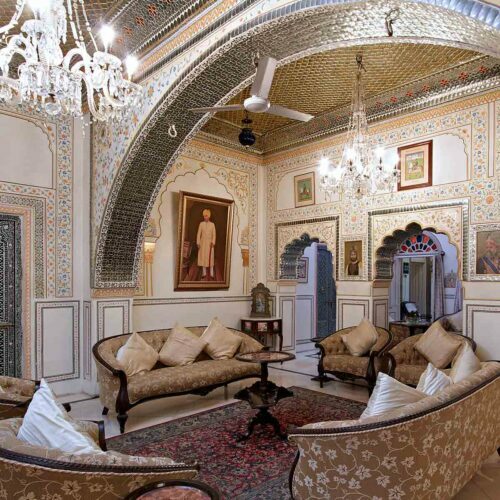 Having been carefully restored, this historic haveli was converted into a heritage hotel in 1994. Alsisar Haveli lies in the heart of the Old City of Jaipur, just a ten-minute drive from the popular Pink City with all its major sights and museums. The hotel is owned by the “Kachawa” clan of Rajputs who for more than five centuries ago founded a sub-clan popularly known as “Shekhawat”. In the lobby one can see the intricate Shekhawati frescos adorning the ceilings. 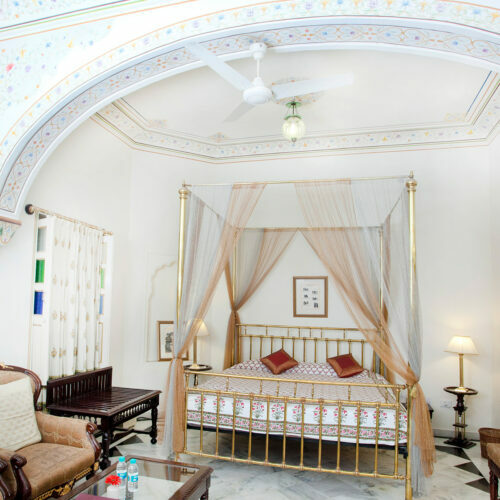 This heritage haveli has a dramatic facade displaying the traditional Rajput architecture with rambling courtyards, stained glass windows, serene alcoves, and lush greenery. 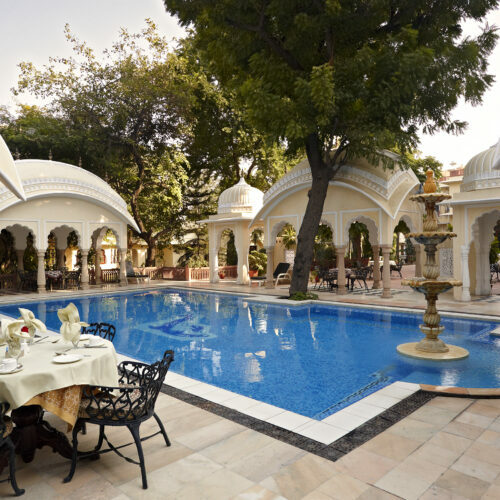 Enjoy the ambience at the outdoor swimming pool surrounded by the ornate gazebos and cenotaphs. This exotic heritage hotel has 45 tastefully crafted and well-equipped heritage style state of the art rooms with all the latest mod cons, including individual temperature control, and spacious bathrooms. Antique furniture, intricately carved poster beds and delicate block printed fabrics, charmingly enhance the Rajasthani experience. Although there is no lift, the larger rooms on the upper floors have four poster beds and beautifully painted ceilings. The guests can indulge with the multi-cuisine delicacies at the in-house restaurant where there is a focus on North Indian specialties and local desserts. 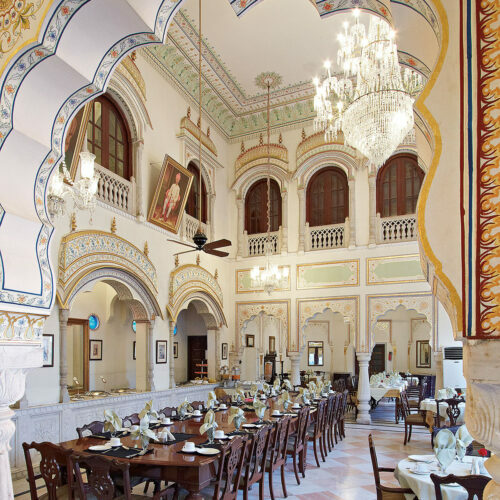 The spacious dining hall has an elegant décor with a mezzanine level overlooking the smart Durbar Hall. There is an intimate ayurvedic spa within the hotel and the in-house boutique provides a well curated selection of local Jaipuri goods and fabrics. The Hotel is well equipped with its reading room, outdoor swimming pool, indoor games, tennis, cultural programs, puppet show, and camel & jeep safaris that can be organized by the hotel. 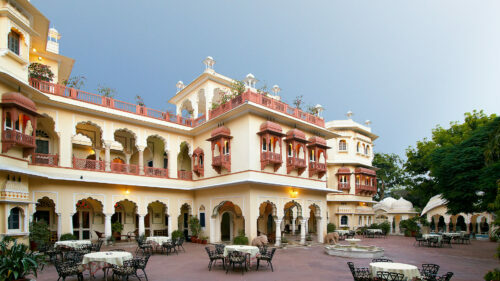 The hotel is located 14 kms from Jaipur airport and 2 kms from the main railway station.